Boone Gardiner’s Landscape Department reflects the experience and expertise of four generations of landscape nursery people and designers. We are experts in specialized areas of plant materials and have a degrees in Horticulture and Landscape Architecture. Boone Gardiner’s focus in rare, unusual and underused plants allows our designers to select from a wider pallet of plant materials than anyone in the region. We are a full service design/ build firm and offer total project management to our clients. Each client receives “The Boone Gardiner Experience” whether it is a small job or a sky’s the limit master design project. 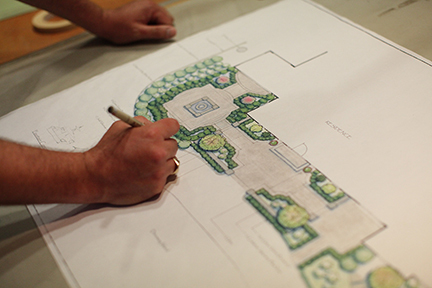 Our talented and highly-experienced design team excels at developing concepts for all scopes and styles of landscapes. We understand the importance of creating landscapes to match not only the style of your architecture but also the scale of it. We accomplish this by following a defined design process. Call 243.3832 to schedule a design consultation with one of our designers.